We've all been there: we need to get up early in the morning but can't seem to fall asleep. no matter how hard we try, it just doesn't happen. this happens primarily when people are under an excessive amount of stress, whether it's work-related stress, school-related stress or just general life-related stress. This has been happening to me a lot recently. At first, I didn't understand why but then I sat down and really thought about it and came to the conclusion that I was stressed because of Uni. After I got to the root of the problem, I started tackling it. I made a few changes to my daily routine and my stress level diminished a lot. Still, though, my sleep pattern was off, so I started doing some things before bed. Here's how I got around falling asleep faster and started to sleep better. 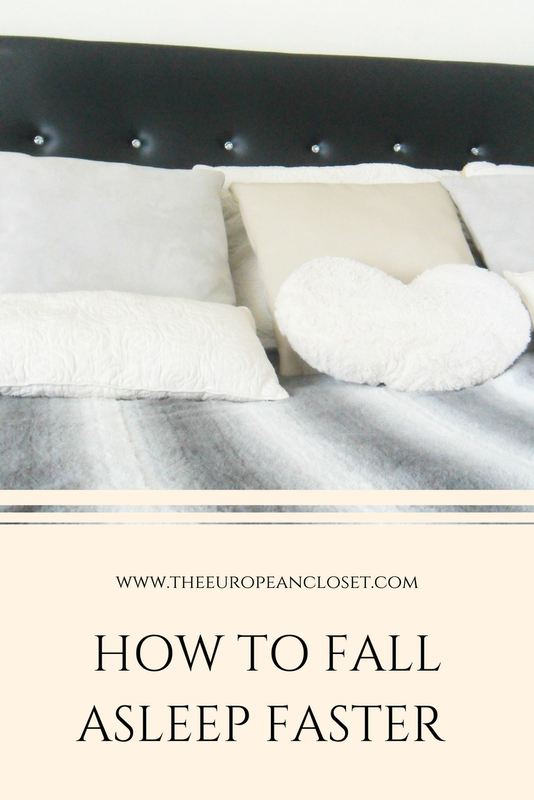 I've talked about this on my 'How To Sleep Better' post and it's something that really helped me. Electronic devices like phones, Tv's and computers stimulate your brain, making it very awake. If you want a good night's sleep, turn them off (or at least put them on silent mode and away from you) 30 minutes. Nothing drives more insane than a messy space. I think I'm a bit OCD when it comes to tidying up and organising. I can't go to bed without tidying up my bedroom and I think that's something that really helps me to fall asleep faster and have a better night's sleep. I know it sounds kinda weird but it's true. Try it. This is crucial for a good night's sleep. Your room can't be too hot nor too cold or you won't fall asleep as you'll feel uncomfortable. Also, try soothing aromas: there are these sprays made specifically to help you fall asleep. Being worried keeps you up at night. Your mind is all over the place and not calm and relaxed like it should be. Try writing down everything you're thinking about whether that is things you need to do the next day or random thought. Write it down. I hope these tips can help you. Let me know what you normally do to sleep faster!